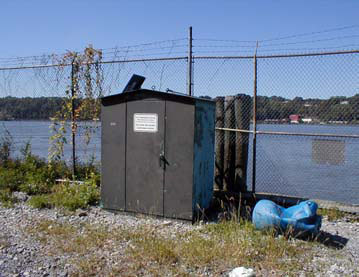 LOCATION.--Lat 41°39'03", long 73°56'42" referenced to North American Datum of 1927, Dutchess County, NY, Hydrologic Unit 02020008, on left bank at IBM pumping station, 2.3 mi south of Poughkeepsie, and 3.5 mi south of the Mid-Hudson bridge. PERIOD OF RECORD.--March 2002 to current year. Daily elevations published since May 1992. GAGE.--Water-stage recorder and acoustic velocity meter. Datum of gage is NGVD of 1929. To convert elevations to NAVD of 1988, subtract 0.88 ft. REMARKS.--Prior to September 2012, discharge computed with an uplooking acoustic velocity meter. Since September 2012, discharge computed with a sidelooking acoustic velocity meter. Blanks in discharge tables, July to October 2002 and July to October 2007, are the result of the salt front adversely affecting measured velocity. All other blanks in discharge tables are due to interruption of record. Prior to October 2002, elevation published as maximum, minimum, and mean elevation. Elevations are not corrected for changes in water density. Blanks in elevation tables are the result of only one high or low tide during a day or interruption of record. EXTREMES FOR PERIOD OF RECORD.--Maximum daily discharge, 240,000 ft³/s, Aug. 29, 2011; maximum elevation recorded, 9.54 ft, Oct. 29, 2012, but may have been higher during period of instrument malfunction, outside elevation was 9.28 ft, from floodmarks; minimum daily discharge, -24,900 ft³/s, Oct. 14, 2003, but may have been lower during period of missing record; minimum elevation, -4.38 ft, Mar. 14, 15, 1993. PERIOD OF DAILY RECORD1.-- SPECIFIC CONDUCTANCE: May 1992 to current year. WATER TEMPERATURE: May 1992 to current year. INSTRUMENTATION1.--Water-temperature and specific-conductance satellite and telephone telemeter provides 15-minute-interval readings. REMARKS1.--Temperature readings prior to Oct. 1, 2007, rounded to the nearest 0.5 °C. Specific conductance occasionally affected by local runoff. Interruption of record was due to malfunction of recording instrument. EXTREMES FOR PERIOD OF DAILY RECORD1.--SPECIFIC CONDUCTANCE: Maximum, 2,900 Ã¬S/cm at 25 °C, Sept. 8, 2002; minimum, 96 Ã¬S/cm at 25 °C, Jan. 30, 1995. WATER TEMPERATURE: Prior to Oct. 1, 2007--Maximum, 29.0 °C, Aug. 14, 2005; minimum, 0.0 °C on many days during winter periods, except 2002. WATER TEMPERATURE: After Oct. 1, 2007--Maximum, 28.6 °C, Aug. 13, 14, 2016; minimum, -0.2 °C, Feb. 6, 7, 2010, several days during February 2011 and 2014 winter period.